When I was in London last month I visited the Tate Modern one afternoon to see the Yayoi Kusama exhibition. I've been meaning to go since it opened back in February and I'm really pleased I got chance to see it before it closes in a couple of weeks. The exhibition explores Kusama's life, work and friendships throughout the decades charting her struggle as a fledgling artist to her present day work. Alongside her work, letters, airline tickets, posters and news clippings tell her story. Her paintings, sculptures and large installations reflect her experiences and capture her life. Her performance art where she encouraged people to paint polka dots on each others bodies during the free love hippie movement of the 1960's is explored, and her often phallic sculptures are on show. She began to integrate photographs of herself into her work surrounded by her beloved polka dots. Her signature polka dots are seen throughout the exhibition. 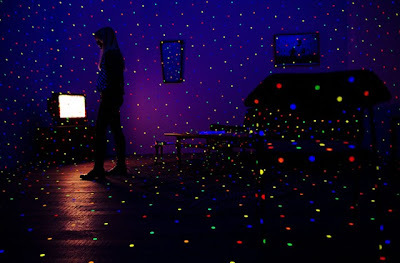 One of my favourite displays is 'I'm Here, but Nothing' which is a darkened room covered in coloured fluorescent polka dots which shine in the dim light. It's suggested the dots could be read as Kusama's attempt to stage her past hallucinations in which she senses the physical world overtaken by repeated forms. 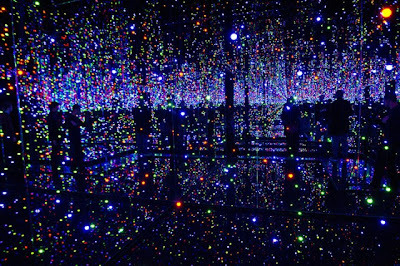 The 'Infinity Mirror Room' provides a spectacular finale to the exhibition. As you walk through the infinite space the lights change colour creating a magical effect. 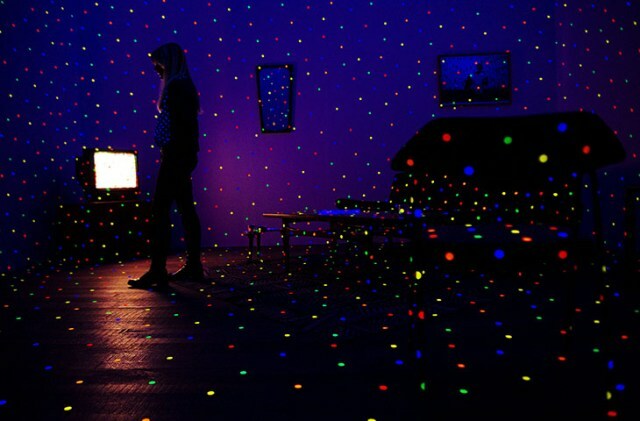 This specially designed room is the largest of Kusama's installations. The experience offers the opportunity for the viewer to explore and be surrounded by their own image, suspending their sense of self and gaining a glimpse into the world of Kusama. The exhibition runs at the Tate Modern until June 5th. It's a truly fascinating look into Kusama's world and definitely worth a visit if you're in London. Have you visited any exhibitions lately? Wooow what's the amazing room with these stars! Thanks for comment, for one moment I'll write my new post, but unfortunately there won't about my pictures,cuz' I haven't them now :( xox. OH WOW. This exhibit is just fabulous! I really love "I'm Here, but Nothing!" It just looks so super cool. Wowsers that infinity room looks amazing! Like some sort of weird artistic disco! I'm not really the artsy arsty type to be honest, portraits and that can bore me quite easily but I LOVE installations. I just like how they are interactive and spring into life rather than just being on a wall! Wish I could have a look in London now when I was last down there! Oh wow that looks like an amazing exhibition! I have seen barely anything lately, I really need to spend a day or 2 in London and do a whistle stop tour because there are so many I want to see!! Wow what an amazing exhibition! Very visually stimulating, absolutely love the look of the mirror room!